“Save and Be Rich”. This is the motto of Iyaledi Savings and Credit Co-operative Organization (SACCO) located in Iyaledi trading centre in Katera Sub-county in the Eastern Uganda district of Serere. Starting with a membership of 27 people from four surrounding villages in 2007, the SACCO has since grown its membership to 137 people, who must each subscribe to a minimum of ten shares each costing Ushs10,000. Members’ savings now stand at Ushs160m and the loans portfolio at Ushs300m. That trust has been reinforced by a system of focusing on small loans as well as lending to women. Ekamu says that women are a lower risk because they repay promptly compared to men. “The women are more consistent in paying back the money in time. Also, women normally don’t fail in business; we men are more prone to failure,” he said. Focusing on women is a policy that dates back to when the SACCO was founded. Initially they would award loans as small as Ushs10,000 to women who would invest in small scale businesses such as beer-brewing and selling of second-hand clothes. Ekamu is proud to point to the Ushs500m asset base that they have grown over the years as a sign of their success. The assets include land in commercial centres such as Soroti Municipality, a hardware shop, rental units, a clinic and a truck, recently acquired at the cost of Ushs90m. Ekamu also prides in the fact that their borrowers now come from as far as Soroti, Kumi and Keberamaido districts. Iyaledi owes its success also to its lending policies and loan recovery strategies that include a dedicated and well motivated team of two people that waste no time to impose fines on defaulters. Ekamu notes that for a borrower to qualify for a loan, they must have two guarantors that are well known to the directors of Iyaledi and can vouch for the integrity of the borrower to pay back the money. Iyaledi makes certain they have the details of the borrower and guarantors by taking their pictures with the borrower. They use a Selig instant camera that even records their fingerprints. “That is the way we have managed our money,” Ekamu boasts. If there is delay in paying back the money, the loan recovery machinery will first approach the guarantors to put pressure on the borrower to pay. This is because the guarantors are considered the main port of call when a loan goes bad. In most cases, Iyaledi has not even had to go after the borrowers because the guarantors have brought the borrower to pay back the money. As a result of these stringent measures Ekamu says they have written off only 48 loans. And to cushion the SACCO against such losses, it has set aside a risk capital of Ushs13m, where they access the money to ward off any loan failures. Ekamu says that because of their prudent management style, they have managed to stay liquid and therefore have not required borrowing from institutions such as the Micro Finance Support Centre. Ekamu says the SACCO currently has two types of lending portfolios: lending to members at 2% per month, while lending to non-members gets the organisation a bigger reward of 3%. On lending, the SACCO has recorded an impressive loans disbursement rate of 50 beneficiaries on a daily basis, according to Ekamu, and a monthly average of about Ushs50m. This makes the Iyaledo office premises a busy place where on average their lowest collection in a day is around two million shillings: it is more-or-less a banking operation. This buzz of activity has made Iyaledi a centre of attention in this-otherwise sleepy trading centre. And because the Iyaledi board is not anxious to enlarge the membership their success has inspired the sprouting of similar entities around Iyaledi trading centre. For now though, the bulk of savings and lending activities happen among small groups of about a dozen people. 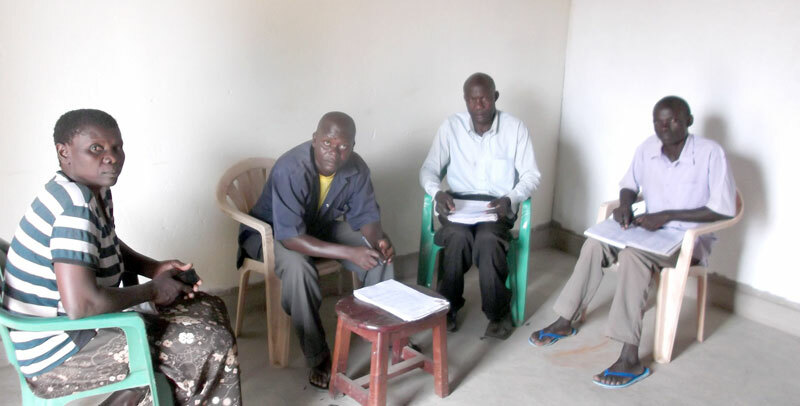 The Executive members of Iyadeli SACCO in a meeting on loan applications. The board of the SACCO, the top most policy-making organ of the organisation comprises nine members headed by a chairman. As with other companies, management is headed by a manager, with a cashier and four loans officers and internal auditor as the notable staff of the SACCO. That marked difference is visible in a number of places already. According to Ekamu, the profitability of the SACCO is so good that he is in position offer a flat reward of Ushs 100,000 to every member every quarter. According to Ekamu’s testimony, Iyaledi operates in a unique fashion that largely defies the characteristics of a genuine Savings and Credit Cooperative Organisation. It’s limited membership, otherwise referred to as closed bond, is unlike many SACCOs that operate in geographical settings such as Serere. The practice of lending to non-members and a focus on interest accumulation as sources of capital, as opposed to members’ own savings, has put the SACCO on a high wire. Experts in the SACCO industry warn that asset accumulation by some SACCOs, at the expense of growing savings and lending, is inimical to the sustainable development of a SACCO. Colin Agabalinda, the Programme Coordinator of the Project for Financial Inclusion in Rural Areas (PROFIRA) which is trying to build capacity of SACCOs across the country, expressed fears about the practices of Iyaledi. “Some people start a company with the intention of operating like a bank by mobilizing savings and providing loans to people. Then at some point, they realize it’s illegal to accept deposits. In order for them to legalize their activities, they register as a Cooperative, but they continue to operate their deposit and lending activities. Iyaledi’s other weak point relates to the way it has spread the SACCO’s resources into other ventures that are outside its core of savings mobilization among members for purposes of lending. In fact, as Agabalinda points out, although some SACCOs have invested money in assets such as buildings and land, this has quite often proved to be a source of problems for SACCOs that can even lead to the SACCOs collapse. According to Agabalinda, the motivation to build or accumulate assets, is sometimes originated by the managers who use the venture as a means to obtain money by exaggerating the cost. Agabalinda points out that as part of the capacity building PROFIRA gives to SACCOs, sensitizing members not only to understand the principles of a cooperative, but also to avoid veering off the core mission mobilizing savings and providing loans to members is very important.